In 1983, the United States Football League (USFL) came into being. It offered spring football and one of its great strengths was getting a network TV deal with ABC and a small cable channel known as ESPN. The idea for the USFL came from New Orleans businessman David Dixon who thought there was a thirst for football in the NFL off-season. The league would be predicated on locating franchises in big cities, a TV deal, deals for NFL sized stadiums, and controlled player spending. The league started with 12 teams and had a network deal. They did have a problem with landing stadiums for some of the teams as a franchise in San Diego couldn’t land Jack Murphy Stadium and had to move, while the Boston Breakers had to play at small Nickerson Stadium on the grounds of Boston University. Antitrust concerns thwarted a hard salary cap, so there was a “gentleman’s agreement” to limit spending that teams like the Chicago Blitz and Michigan Panthers never lived by. In addition, the New Jersey generals bypassed the cap altogether because they had the chance to sign Georgia junior and then Heisman Trophy winner Herschel Walker when signing underclassman at the time was something that the NFL wouldn’t do. The league allowed the Generals to sign Walker because they thought it would be good for the league. For the first season, ratings were excellent. The problem was that the ABC deal didn’t pay as much as the owners needed to fund their teams and there were some teams that were woefully underfunded. Rather than contracting the weak times, the league expended to 18 teams for 1984 because they wanted the expansion fees to keep the weaker teams afloat. In addition, Generals owner J. Walker Duncan sold his team to a real estate developer you might have heard before, Donald Trump. Trump opened his checkbook and bought a bunch of NFL all stars like Brian Sipe, Gary Barbaro, and Jim LeClair. The expansion Houston Gamblers signed Jim Kelly and the LA Express signed to a heavy annuity based deal with Steve Young that might have been worth over $40 million over time. The expansion Pittsburgh Maulers signed the next Heisman winner, Mike Rozier. The spending by USFL owners was hurting the league as their attendance and TV deals couldn’t support the spending. Their spending war with the NFL over draft picks and NFL players came at a huge cost. While the Generals were doing well in attendance, even Trump was losing money. However, Trump could afford it and he probably figured that purchasing a USFL franchise on the low was a good deal because he probably thought he could eventually pressure the NFL into giving him a franchise in New York since New York now had both NFL teams in New Jersey. Trump probably thought he could get New York for himself with a proposed stadium in Queens and he needed a merger for that. How could Trump get a NFL-USFL merger? Well, a lawsuit would be good. 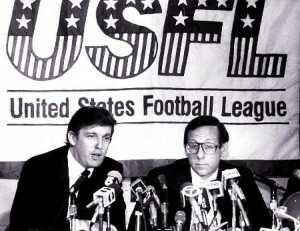 Trump convinced almost all of the owners left in the USFL to move the league from a spring schedule to a fall schedule. Trump reasoned that if G-d wanted football to be played in the spring, he wouldn’t have invented baseball. That’s an interesting point for someone who bought into a spring football league. Anyway, Trump had the USFL move to a Fall 1986 schedule after playing a lame duck Spring 1985 schedule. The USFL then immediately filed an anti-trust suit against the NFL because of what they thought were monopolistic abuses by the NFL in terms of stadium control and TV contracts. While ABC was happy to provide coverage for a spring league, the glut of NFL and college football on the schedule made a fall USFL of little interest to them. It was clear with teams dying in 1985 and after the Spring season ended, that the USFL was putting its future on the anti-trust suit. The USFL ended up winning the lawsuit, but the league was only awarded $1, trebled to $3. The reason was because the jury thought that while the NFL was a monopoly, it was the USFL’s poor business decisions that caused their financial suffering. In addition, the USFL lawyers made Trump one of their star witnesses and NFL lawyers were able to use Trump as a weapon against the USFL saying that the lawsuit was just Trump’s way to get a team through a forced merger. The league suspended operations after the lawsuit. The USFL could have been a viable Spring league as long as they stuck to the Spring and kept spending in check, they just got trumped in more ways than one.